A muse can lurk anywhere. Ｓome hide within the chorus of a childhood tune. Others breathe on the walls of art galleries. When it comes to discovering a muse, never limit yourself to just one. While time consuming, movies make for miraculous muses. A song can put you in a mood, directly stimulating the imagination through your auditory senses for a few minutes. But a movie invites you inside for an experience over an extended period of time. Movies manifest more than moods, they mold the viewer into thematic characters. This is why I avoid horror films. For weeks, I’ll be witnessing poltergeists peeking over the shower curtain. After Gladiator, I marched through the neighborhood ready to assault everyone in my path. This phenomenon also explains why I’ll only watch Broke Back Mountain when surrounded by women. However, it also explains why The Door in the Floor is my writing muse. 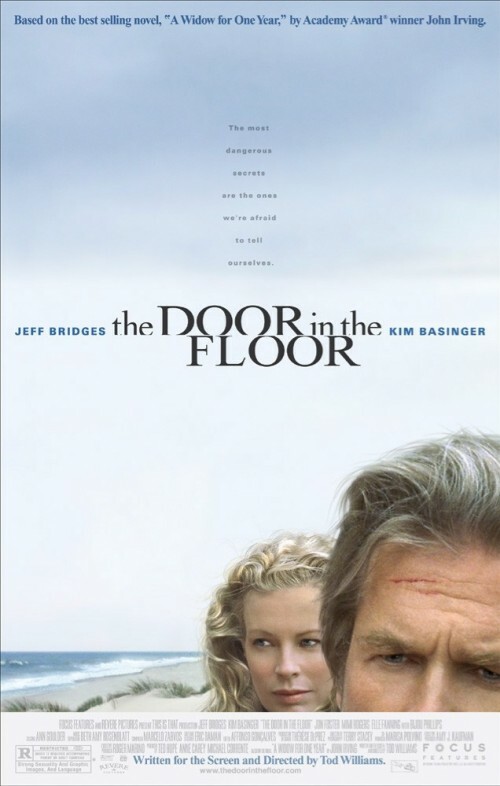 Released in 2004, Door in the Floor, directed by Tod Williams and based on John Irving’s A Widow for One Year, profiles celebrity children’s author Ted Cole (Jeff Bridges) as he copes with the growing distance between his wife (Kim Basinger) after the death of their two sons. Bridges won an Oscar for Crazy　Heart playing a has-been alcoholic musician, yet his performance here as a compassionate alcoholic writer is as compelling if not more mesmerizing. While Cole’s career as a writer is background fodder, the screenplay swims in ‘muse-ical’ sound bites. Early in the film Cole says, “Writing is rigorous work. I keep myself incredibly busy,” after finishing a casual game of squash. How could possibly consider himself busy, especially when most of his afternoons were filled with wine, cheese as he sketches naked women? Well, he was right. A writer does need to keep busy, and that’s all. Sure, they have to write, but they also need to be ‘living life’ and feeding the senses. While a tragic drama, the film provocatively paints the life of a (rich and famous) writer. Whenever I find myself slipping away from writing, I push play and let The Door in the Floor set me straight on the path towards success. If time is short, head over to American Rhetoric’s Movie Speeches and watch the video or download the mp3 of Ted Cole reading The Door in the Floor. Mary and Max, a 2009 Australian claymation film about two unlikely pen-pals is a must view for any children’s writer. While the content is mature and explores the psychological impact of individuals shuttered from the comforts of social society, it’s presented in the style of a children’s book. It’s a movie intended for adults though the narration reads as if it was torn from the pages of a picture book. The opening line, “Mary Dinkle’s eyes were the color of muddy puddles; her birthmark the color of poo,” would be enough to entice an editor to review the manuscript. Though be warned, while rated PG, it explores dark themes that may be confusing or inappropriate for children. Instead, when the children are asleep, or when you’re unable to end the night, nestle up on the couch and watch this film. Toni Collette, Phillip Seymour Hoffman, and Eric Bana provide depth with their voices, though its Barry Humphries’s narration you need to study. The film is carefully woven around a detailed script that reads eloquently and quickly like a picture book. Take the time, and check out this creative gem.